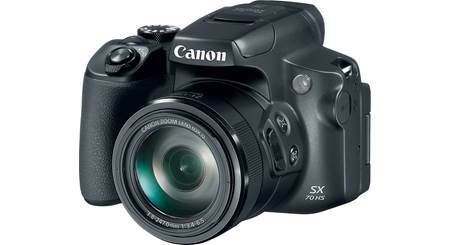 The Canon PowerShot SX740 HS is small enough to throw in a backpack. 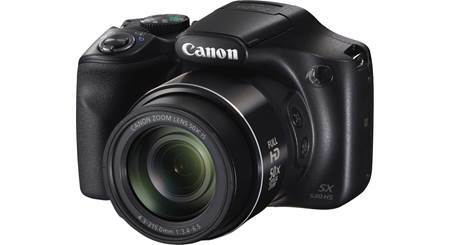 The Canon PowerShot SX740 HS is small enough to throw in a backpack. Its small size belies the amazing things it can do. 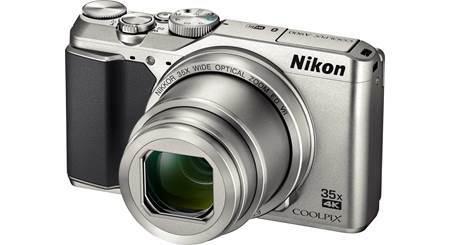 It shoots sharp, clear 20.3-megapixel stills, and records dazzling 4K video at 30 frames per second. It's a no-brainer to take on your next road trip. 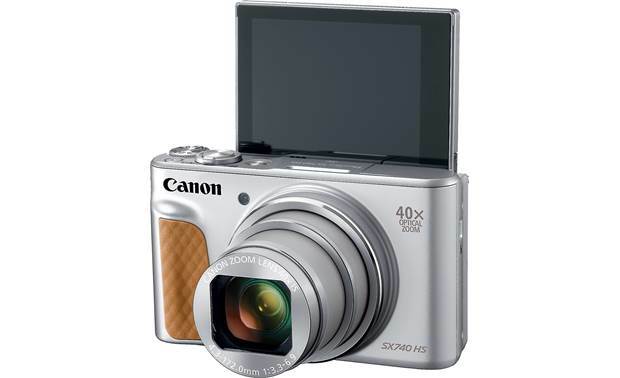 A full-color 3" LCD screen on the Canon PowerShot SX740 HS helps frame and review photos and video. When you use the camera's 40X optical zoom range, you'll find you can capture sharp close-ups of distant subjects. Sure, a smartphone can deliver a small amount of digital zoom. But it also degrades the quality of your photos, leaving you with grainy images that lack clarity. This camera provides outstanding image quality across the zoom range, from a wide-angle landscape to a tight close-up of your kid at graduation. And Zoom Framing Assist makes it easy to track a moving subject when the zoom lens is fully extended. Dual Sensing IS will keep shaky hands from ruining that close-up, too. Thanks to the PowerShot SX740's built in Wi-Fi, it's a snap to wirelessly transfer images from the camera to your smartphone or tablet. Canon's free app for Apple® and Android™ even lets you use your smartphone as a remote, so you can set up the camera on a tripod and use the phone as a monitor and shutter release device. 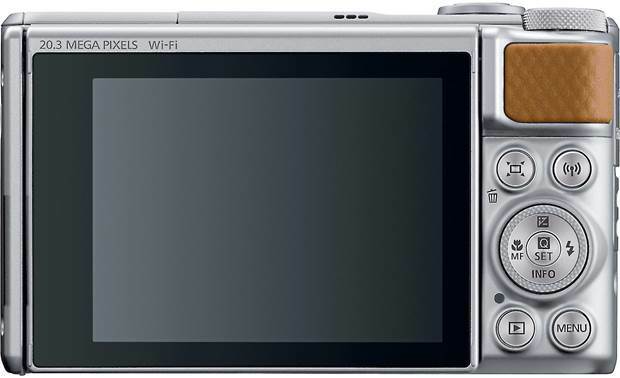 Tilting LCD Monitor: The Canon PowerShot SX740 HS has a 3.0" TFT LCD monitor, featuring 922,000 dots with a 4:3 aspect ratio, and approximately 100% picture coverage. The LCD panel can be tilted upwards as far as 180°, facing the front, allowing you to take self-portraits or from other unique perspectives. The LCD display's brightness can be adjusted to one of five levels. Note: The camera does not have a separate viewfinder. Image Sensor/Image Processor: The camera is equipped with a 1/2.3" CMOS image sensor with 21.1-million total pixels, and 20.3-million effective pixels. The DIGIC 8 Image Processor helps improve auto focusing performance, and lets you capture movies in 4K Ultra High Definition. 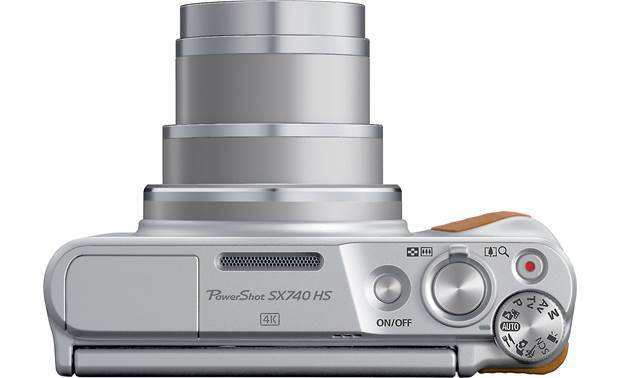 Optics and Stabilization: The SX740 HS has a 40x optical zoom lens with a 4.3-172mm focal length (35mm equivalent is 24-960mm). The built-in Optical Image Stabilizer helps control camera shake to give you clear images when you're zoomed way in. Optical Zoom: The optical zoom range is 1x to 40x, and is color-coded in the monitor in white. Images are clear and sharp. ZoomPlus: The ZoomPlus range is 40x to 80x, and appears in yellow in the zoom range. Digital zoom of 2x is applied to the optical zoom, and the image is not noticeably grainy. Digital Zoom: The Digital Zoom range is approximately 80x to 160x, and appears in blue. Full 4x digital zoom is applied to the optical zoom, making the images appear grainy. Digital Tele-Converter: The focal length of the lens can be increased by an equivalent of 1.6x or 2.0x through the use of the Digital Tele-Converter. The equivalent focal lengths of the lens (35mm equivalent) are 38.4-1536mm when using the 1.6x digital tele-converter, and 48-1920mm with the 2.0x tele-converter. The digital zoom and digital tele-converter cannot be used simultaneously. Using the digital tele-converter may help reduce camera shake because the shutter speed is faster than it would be using the zoom function. Zoom Framing Assist: When you have fully zoomed in and temporarily lose track of your subject, the Zoom Framing Assist function will help you locate your subject. With a dedicated button on the back panel, Zoom Framing Assist causes the camera to zoom out as long as the button is held down, allowing you to locate your subject. When the button is released, the lens returns to its original zoom position, keeping the subject in focus until you're ready to capture the image. Recording Media: The camera records still images or moving images with stereo audio on SD/SDHC/SDXC memory cards, including UHS-I cards. Still images are recorded in JPEG format, and the movies are recorded in MP4 format (Image data: MPEG-4 AVC/H.264, Audio data: AAC stereo). The camera has no built-in memory, and no memory card is included with the camera. Movies: Movies can be shot in 4K (3840 x 2160 at 30fps), Full HD (1920 x 1080 at 60 and 30 fps), and HD (1280 x 720 at 60 fps). Recording will automatically stop when either the clip file size reaches 4 GB or the recording time reaches approximately 30 minutes. High Speed: 10 shots/sec max. Low Speed: 4 shots/sec max. High Speed: 7.4 shots/sec max. Program: The camera sets both the aperture value and shutter speed, allowing you to customize many function settings to shoot your preferred shooting style. Shutter Priority (Tv): You can set your preferred shutter speed, letting the camera automatically adjust the aperture value to suit your shutter speed. Aperture Priority (Av): You can set your preferred aperture before shooting, and allow the camera to automatically adjust the shutter speed to suit your aperture value. Manual: You can set your preferred shutter speed and aperture value to obtain the desired exposure. Auto: The camera will automatically select the best settings for the scene. Hybrid Auto: Lets you make a short movie of the day just by shooting images. The camera records 2-4 second clips of scenes before each shot, which are later combined into a digest movie. Food Mode: The color tones are adjusted to make food look fresh and vibrant. Self Portrait: When you take self-portraits, you can add special image processing, such as skin smoothing, brightness, and background defocus to enhance your photo. Sports: Sports Mode lets you shoot continuously as the camera focuses on moving subjects. Special Scene: Select from the following, according to the scene or effects desired: Portrait, Handheld Night Scene, and Fireworks. You can also add a variety of effects to images while shooting, including: Smooth Skin, Grainy B/W, Soft Focus, Fisheye Effect, Art Bold Effect, Water Painting Effect, Toy Camera, and Miniature Effect. Movies: Record movies in 4K or High Definition. Evaluative Light Metering: used for standard conditions. The area within the frame is divided into several zones and light is measured based on subject position, brightness, direct light and backlighting. Spot: meters the area within the spot AE point at the center of the LCD monitor or viewfinder. Exposure Compensation: If you are shooting against a bright background or strong backlight, you may need to correct the exposure so that the subject doesn't come out too dark. You can set the adjustments from -3 to +3 in 1/3-step increments. White Balance: You can choose from the following white balance settings: Auto, Daylight, Shade, Cloudy, Tungsten Light, White Fluorescent Light, WB Correction, and Custom. 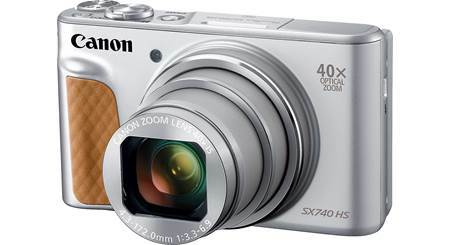 Flash Modes: The PowerShot SX740 HS has a built-in pop-up flash. You can select Auto (flash fires in low light), Slow-synchro, On (flash always fires), or Off (flash doesn't fire). The built-in flash has a range of 1.6' to 16.4' in Wide Angle and 6.6' to 8.2' in Telephoto. In the menu, you can turn on the Red-Eye Reduction lamp for the flash, and apply Red-Eye Correction to the images that have been taken. ISO Speed: The ISO speed can be set Automatically (ISO Auto), or manually ISO 100 to ISO 3200 in 1 EV steps. Lowering the ISO speed results in sharper images but there's a greater chance of subject or image blurring in certain shooting conditions. Raising the ISO speed results in a faster shutter speed, reducing blurred images. The images, however, will appear more coarse. Self-Timer: The SX740 HS utilizes a 10-second, 2-second, and a custom self-timer to allow the photographer to be included in the shot, or to avoid camera shake when using a tripod. The custom self-timer allows you to set the time delay between 2 and 10 seconds in 1-second increments. Index Display: This feature allows you to view 6, 12, 36, or 100 images at once on the LCD monitor so that you can search for an image quickly. Movies cannot be played in the index playback mode. You can view the index display by rotating the zoom lever toward wide angle while the camera is in playback mode. Filtered Playback: When there are many images on the memory card, you can filter and display them by a specified filter. You can also protect or delete all images at once while filtered. Available filters include: Rating, Shot Date, Folder, Protect, and File Type (Still Image/Movie). Shooting Display Options: You can choose to display your photos on the LCD monitor and the viewfinder with and without shooting information. Display options include Simple Information, Detailed Information, Detailed Information 2, or no Information. Red-Eye Correction: You can correct red eyes in already recorded images. However, red eyes may not be automatically detected in some images such as faces near the screen edge, faces that appear extremely small, larger dark or bright in relation to the overall image and faces turned to the side or at a diagonal and faces with a portion hidden which prevents the Red-Eye Correction from working. You can choose to overwrite the file with the corrected image, or store the image as a new file, retaining the original image. PictBridge: Using the supplied USB cable, you can connect this camera directly to a PictBridge-compatible printer of any brand. In this way, you can make prints directly from the camera without having to connect to a computer. 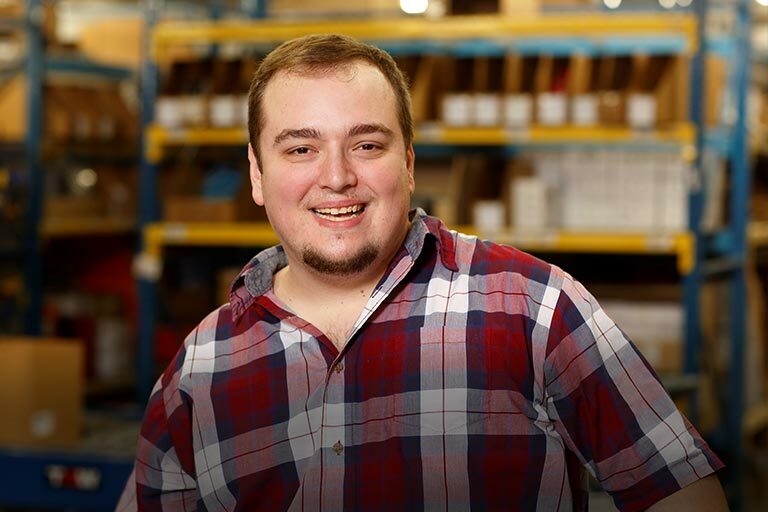 Smartphones/Tablets: With the free Camera Connect app installed on the device, you can send images to smartphones or tablets via Wi-Fi. You can also control the camera from your smart device. If your device has GPS, you can add location information (geotag) to your photos. Computer: Computers running Windows 10, 8.1, 7 (SP1), Mac OS X v10.10, 10.11, macOS 10.12, and 10.13, can connect to the camera via Wi-Fi. Using Image Transfer Utility software, you can save camera images to the computer wirelessly. Printers: You can wirelessly send images to a PictBridge-compatible printer (that supports DPS over IP) for printing. 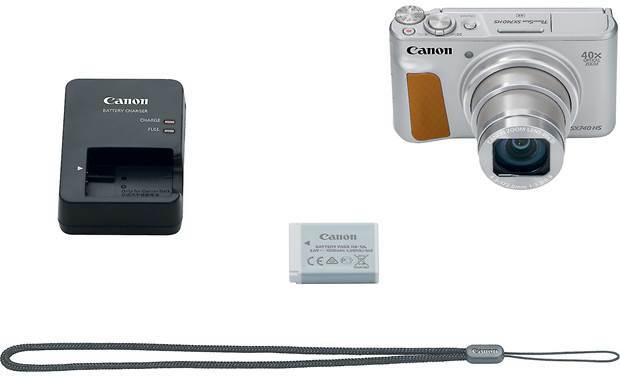 Web Services: After establishing an account for the Canon iMage Gateway on-line photography service, you can wirelessly send images automatically from the camera to another computer or to a web service. Bluetooth 4.1 Features: You can pair the camera with a Bluetooth-enabled smartphone or tablet through the Canon Camera Connect application. Using the GPS information (latitude, longitude, elevation) from the smartphone, you can geotag your images and movies. You can view the shooting location of your photos on a map using the Map Utility program. Map Utility is compatible with Windows 10, 8, and 7 (SP1) and Mac OS X v10.10, 10.11, macOS 10.12 and 10.13. Auto Power Down for Shooting Mode: The screen will turn off approximately 1 minute after the camera is last operated. You can "wake" the camera at this point by pressing the shutter button halfway to turn on the screen and continue shooting. After about 2 more minutes, if no buttons are pressed, the lens will retract and the power will turn off. Auto Power Down for Playback Mode and Connection to a Printer: The camera power down approximately 5 minutes after the last control is accessed on the camera. Note: The Power Saving Function will not activate during a Slide-Show or while the camera is connected to a computer. 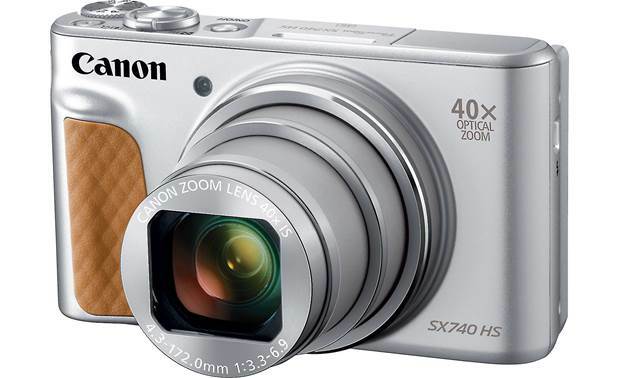 HDMI Output: The PowerShot SX740 HS is equipped with a micro-HDMI (Type D) for connecting the camera to your HDTV. An optional micro-HDMI-to-HDMI cable is required. Digital Terminal: The camera has a Micro-USB terminal to allow you to connect the camera to a compatible computer or compatible printer. No USB cable is included. An optional USB cable must be obtained in order to load images to your computer or printer. Image Transfer Utility: You can automatically transfer images from your camera to your computer. Map Utility: Lets you display GPS information recorded in images on a map. Camera User Guide: The 130-page Camera User Guide is available for download. Camera Connect: The Camera Connect app is a free application for Android and Apple smart devices which enables users to transfer images shot with the camera to the device via Wi-Fi or Bluetooth. The app is compatible with Android devices running Android (version varies with device), and with iPhone, iPad, and iPod touch running iOS 9.0 or later. 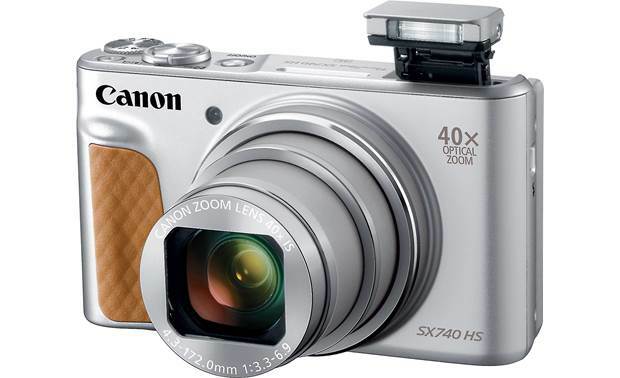 Searches related to the Canon PowerShot SX740 HS 20.3-megapixel digital camera with Wi-Fi® and 40X optical zoom.